RoyalEnfields.com: Chris Zahner talks about making "Chasing the Bullet"
Chris Zahner talks about making "Chasing the Bullet"
In a new podcast, Chris Zahner talks about making his Royal Enfield documentary. "It was a major leap." That's how Chris Zahner describes the making of his film "Chasing the Bullet — a Royal Enfield Documentary." Chris talks about how he did it in a podcast interview with me and Corinna Mantlo, maker of custom motorcycle seats and co-founder of the Motorcycle Film Festival. 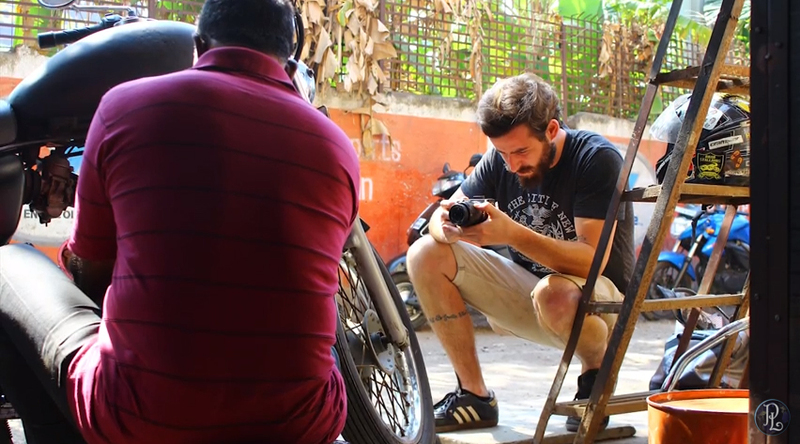 For Chris, the challenge was to go to India and just rely on the passion there for the Royal Enfield Bullet motorcycle to provide the material he would need to capture. It worked. I reviewed the film and liked it. There's a freshness and excitement underlying "Chasing the Bullet" that keeps it moving. That may have been the pressure of having to get it done on virtually no budget. Much of his equipment was second hand, some of it almost antique. An initial Kickstarter campaign to help fund the film failed, giving Chris no monetary cushion just hours before he was due to leave for India. He got on the plane anyway. "I like to use the phrase: 'Jump in the deep end,'" he explains. With the film done, he put "Chasing the Bullet" on YouTube, where you can watch it — for free. That blows me away. Chris and Corinna explain on the podcast why an artist would even consider giving away his work. "It was much more important for me, if I want to continue to do this stuff, I have to show it is affecting people and I'm building an audience," Chris says. On the podcast, Chris also describes another project, his customizing of a Royal Enfield Continental GT. The finished bike was recently featured on The Bike Shed website. The inspiration for the bike came while he was making the film in India. A U.S. dealer, Royal Enfield of Fort Worth, provided a Continental GT for him to realize his vision. Talk about jumping in the deep end — with someone else's motorcycle! On the podcast, Corinna points out the dual truisms that "you talk about there's no money in motorcycles, there's no money in films..."
"We give to the motorcycle community, involve ourselves in it, because of what it gives back to us. It's not always monetary." Give the podcast a listen. I think you'll enjoy it.